DC Comics Vintage Print Blazer | Nerd Much? For all of those times you wish you had the perfect blazer to inspire you through your own unique boss battles, the blazer you didn’t know you were looking for is finally here. 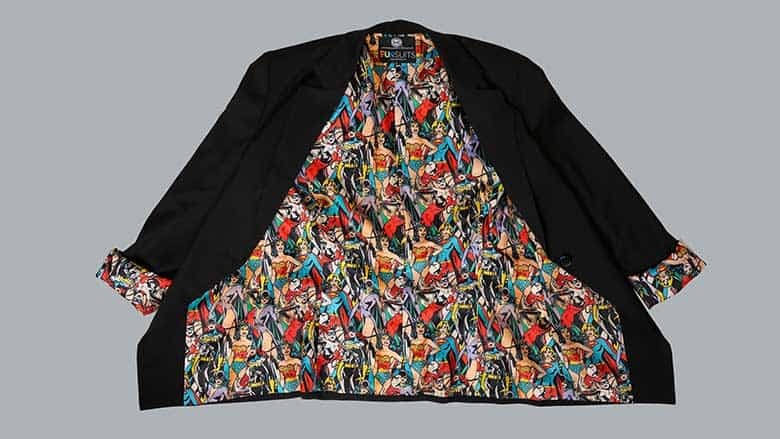 Get ready to be fiercely fashionable and simultaneously channel some of your favorite DC super heroes with this DC Comics Women’s Vintage Print Blazer from FUN.com. This new “office trail-blazer” released with a vibrant print inspired by DC Comics features some of your favorite fierce female super heroes. Harley Quinn, Wonderwoman, Batgirl, Supergirl and Catwoman are all here to help you take command of the boardroom, or any room. With a sharp black exterior, this blazer is the perfect item to coordinate with your wardrobe. Uniquely designed with a notched lapel and front faux pockets, this blazer is both elegant and sleek. Three buttons on the sleeve compliment the simple and comfortable one button front closure. With the colorful heroic print tucked neatly away on the interior lining, it is easy to reveal your DC Comics style anytime. Roll up your sleeves to get down to business and unveil the colorful design underneath. Show your bright heroic side the next time you need a little bit extra to get you through the work day, or just take solace in knowing the vintage comic pattern is there. This blazer is made from 80% polyester and 20% rayon, remember to dry clean only. Love it? Want more? You are in luck; a coordinating black skirt and pants are also available from FUNwear. So, upgrade you wardrobe today. This classic fit one button blazer is a steal at just 39.99 and is currently available in women’s sizes 2 through 14 (sorry guys). Looking for a great gift for the Wonder Woman in your life? Show how much you care and order yours today! Buy the DC Comics Vintage Print Blazer here.